I modified this recipe from an original — and wonderful — one whipped up by Registered Dietitian Jane Harrison of My Optum Health. If you are on Twitter, you can follow Jane there. My version retains 95 percent of Jane’s original (I mainly changed a few ingredient proportions and tacked on a few more spices). Jane is absolutely right when she explains that “this hearty soup has it all, including fiber, protein, antioxidants, and a host of vitamins and minerals.” I was very happy when I tallied information for the recipe and came up with the terrific values posted towards the end of this post. I made this soup slightly more caloric than the original recipe, so depending on your calorie needs, it can be followed by a standard entree, a half-sandwich, or a salad. 1. Sauté garlic and onion in olive oil for about 5 minutes over medium-high flame, until lightly browned. 2. 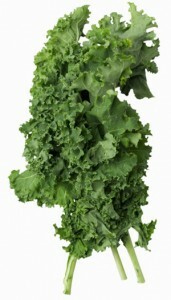 Add kale and stir continuously for 2-3 minutes. 3. Add broth and sweet potatoes. Bring to a boil and simmer for about 20-30 minutes, until sweet potatoes are tender. 4. Add garbanzo beans and coconut milk. Stir for 2 – 3 minutes. 5. Add spices, stir for 30 seconds, and serve. NOTE: The saturated fats in coconut — along with those in cacao — are the least harmful of the saturated fats. Coconuts are high in lauric acid, a saturated fat which increases LDL cholesterol but also simultaneously raises HDL cholesterol. I certainly think consumer knowledge and awareness of non-dairy sources of calcium in the United States — and other Western nations — is practically non-existent. 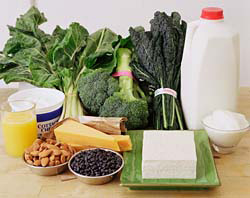 Although dairy products certainly offer calcium, so do some leafy green vegetables (bok choy, kale, mustard greens, and collard greens), canned fish (salmon with bones, sardines), chickpeas, tempeh, and almonds. Part of the “problem” is that the majority of educational materials on calcium are paid for — and distributed — by the National Dairy Council, which not only plunks down $100 million annually in advertising, but also doles out as much money in the way of research grants. I recently conducted a small-scale research project which, among other things, examined calcium awareness among vegans and non-vegans. One part of the questionnaire respondents were asked to fill out included a food frequency questionnaire which included 41 foods that were high, moderate, or low sources of calcium. 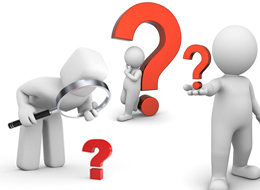 A subsequent question asked respondents to list any foods in that list they were not aware contained calcium. Almost two thirds of those surveyed were surprised to see broccoli, kale, mustard greens, bok choy, chickpeas, and tempeh make the list. Hey, PETA, how about giving the silly publicity gimmicks a break (you know, like your campaigns to have breast milk in Ben & Jerry’s ice cream or change the name of the Pet Shop Boys to The Rescue Shelter Boys?) and investing a significant amount of money in educational materials for the general population on non-dairy sources of calcium? With their sparkling nutritional profile, chickpeas — and all their wonderful phytonutrients — are a wonderful addition to salads, casseroles, and pilafs. This recipe changes up their usual texture, creating a savory and delicious side dish that also makes for a fun finger food. Transfer mixture to roasting pan and heat in oven for 20 minutes, shaking every 5 minutes to ensure even browning. Like a lot of other vegetarians, I love hummus, and always thought it was a really good source of protein since it is made from chickpeas. [However,] I just looked at the nutrition facts for a container of hummus I bought and see that each serving only has one gram of protein. That doesn’t seem right to me. 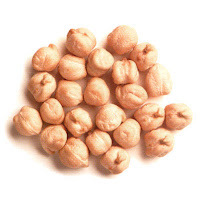 Aren’t chickpeas pretty high in protein? I often hear people erroneously refer to hummus as a “protein-packed” spread. Although it is a decent — and delicious — source of heart-healthy fats, it is no protein powerhouse. You are right — chickpeas deliver quite a bit of protein. A mere half cup of them adds six grams of protein to your meal. How, then, do two tablespoons of hummus only add up to one gram? Simple — hummus is more than just mashed chickpeas. 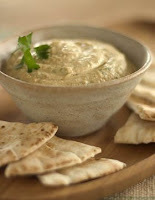 Garlic, lemon juice, tahini (sesame seed paste), salt, and olive oil round out traditional recipes. Thus, two tablespoons of hummus contain approximately one tenth of a cup of actual chickpeas! To get the six grams of protein in a half cup of chickpeas, you would need to eat approximately one cup of hummus. If adding some protein to your day is a priority, you are better off adding half a cup of chickpeas to your salad (6 grams of protein, 143 calories) than using a cup of hummus as a dip (6 grams of protein, 410 calories).